If you're a fan of comfort dressing when it comes to fashion, you'll love this on-trend pairing of a Frame Classic Fit Long Sleeve Stripe Crewneck T Shirt from Nordstrom and mustard shorts. Got bored with this outfit? Enter brown leather boat shoes to jazz things up. 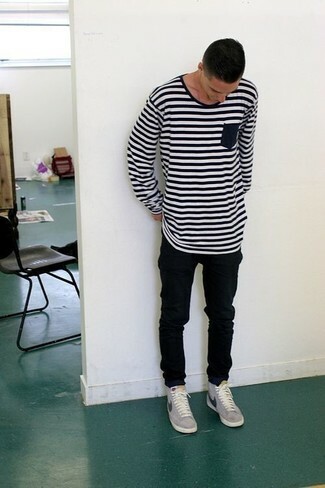 Try teaming a Frame white and black horizontal striped long sleeve t-shirt with black skinny jeans, if you feel like functionality dressing without looking like a slob. You could perhaps get a little creative in the shoe department and lift up your getup with grey low top sneakers. 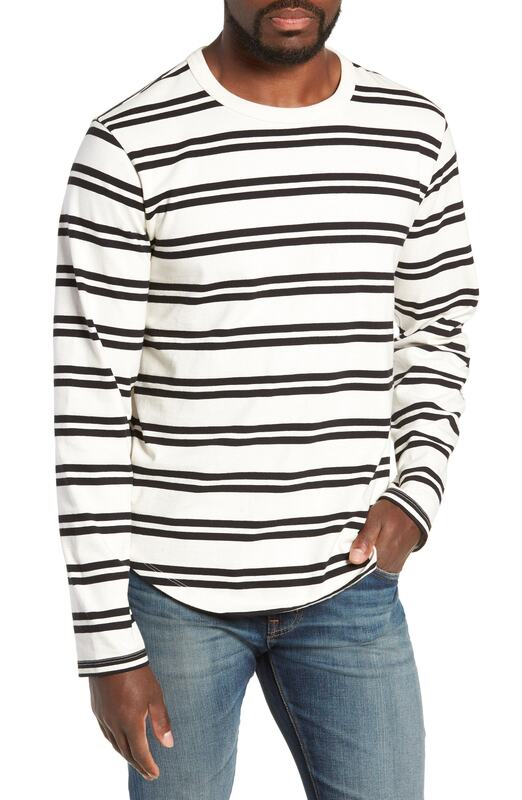 If you're all about being comfortable when it comes to dressing up, this combination of a white and black horizontal striped long sleeve t-shirt and navy skinny jeans is right what you need. Dark brown suede desert boots will instantly spruce up even the laziest of looks. 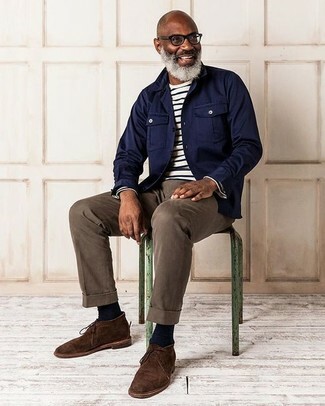 If you're on a mission for a casual yet sharp ensemble, choose a Frame Classic Fit Long Sleeve Stripe Crewneck T Shirt from Nordstrom and brown chinos. As well as super comfortable, both pieces look amazing when worn together. And if you want to instantly up the style ante of your look with one piece, add dark brown leather casual boots to the mix. 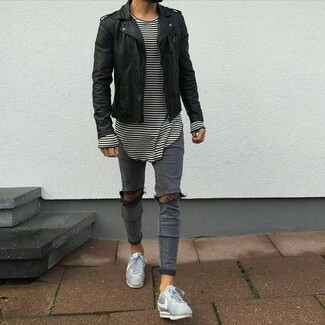 Choose a Frame Classic Fit Long Sleeve Stripe Crewneck T Shirt and grey ripped skinny jeans, if you want to dress for comfort without looking like a hobo. You could perhaps get a little creative in the shoe department and elevate your getup with grey low top sneakers. If you prefer functionality dressing when it comes to your personal style, you'll love this stylish pairing of a Frame white and black horizontal striped long sleeve t-shirt and light blue jeans. 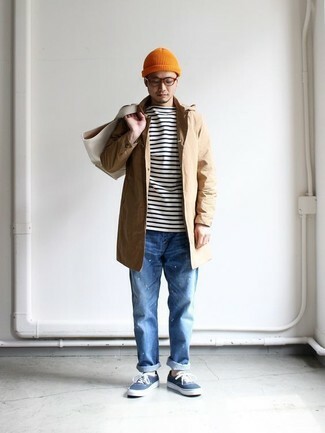 We all getup for comfort when it comes to dressing up, and this combination of a Frame white and black horizontal striped long sleeve t-shirt and blue jeans is a great illustration of that. Blue canvas low top sneakers are an easy choice here. If you're on a mission for a casual yet seriously stylish getup, pair a Frame white and black horizontal striped long sleeve t-shirt with brown chinos. As well as super comfy, these items look fabulous paired together. To add elegance to your getup, complement with dark brown suede desert boots. If you prefer practicality dressing when it comes to fashion, you'll love this knockout pairing of a white and black horizontal striped long sleeve t-shirt and navy jeans.